If you have any questions or want to enquire about dates, use our form to contact David Eades & Niels Lierow or see their website for more information. Ring the bell on the gate, to enter gardens that are secluded, charming, full of colour with a babbling brook. Here in the heart of Burgundy country you are immersed in the silence of a valley of vines. Light spills into the sitting room through arched vine-clad windows while cream walls and Indian rugs add to the simple elegance of this maison de maître. Antiques and travel are the owners’ passion, and David’s gentle Irish brogue is enchanting (no surprise to hear he has interviewed European royalty for a prestigious magazine). The grand staircase in the centre of this gracious house would not be out of place on a 1930s luxury cruise liner, while interesting paintings and handsome oriental fabrics add up to a mix of styles that work beautifully. Bedrooms vary in size and have lovely seersucker linen and antique prints; bathrooms are classically tasteful. 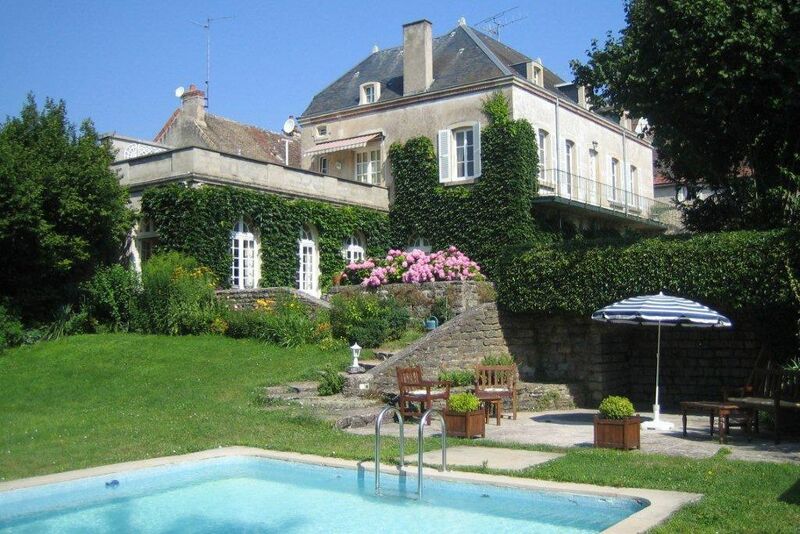 Terraced lawns lead down to the heated pool, the meadows and trees, lavish breakfasts include unusual homemade jams, and the wonderful Voie Verte cycle route, along the former railway, runs nearby. 3 November - 17 March. Hosted dinner with wine, €25-€40. Restaurants 4km. This was our second stay at L'Orangerie and once again everything was perfect: fabulous hosts, a warm welcome, a beautiful room and an exquisite breakfast. It really is faultless. David and Nils always have the best restaurant recommendations too. We will be hoping to fit in another couple of days there in July. Mont Avril: From the house it is an easy 45min walk to the summit,with a lovely panorama of the countryside:the Morvan massif,the Monts du Beaujolais,and the Jura Mts.In clear weather Mont Blanc,180kms distant,can be seen. Tiny wild orchids await you here. Chateau de Cormatin: 25kms south of l'Orangerie, is a moated, turetted fantasy set in a superb formal garden "à la française", with a park of lawns and ancient trees and a walled kitchen garden. Prepare to be overwhelmed by the richness of the interior. Chapaize:A delightful village a few kilometers from Cormatin, Chapaize's jewel is its thousand-year old church. The tower,in typical Cluny style, rises high above the village and can be seen for miles around. Eclectic concerts held regularly in the church. Brancion: "Picturesque“ doesn´t do justice to Brancion, an ancient village on a hill with stunning westward views and dominated by its chateau. The 10th century church, rising out of a lawn, has wonderful medieval frescoes. 500 year old market-hall. Côte Chalonnaise: From Chagny to the little medieval town of St.Gengoux, the lovely hills and valleys of this area are home to chateaux, romanesque churches, tiny villages and vineyards. Charolais cattle graze peacefully, wildlife abounds in the woods. Tournus: This town, on the west bank of the Saône, has a splendid, marvellously preserved Romanesque abbey. There are imposing houses dating from the 16th and 17th centuries and narrow, winding streets. The view from the east bank at sunset is beautiful.